The U.N.’s food agency said it has been able to reach more parts of famine-struck Somalia in the last month but there were still significant security challenges in Mogadishu even though Islamist rebels have left the capital. About 3.6 million people in Somalia are at risk of starvation as the Horn of Africa experiences its worst drought in decades. 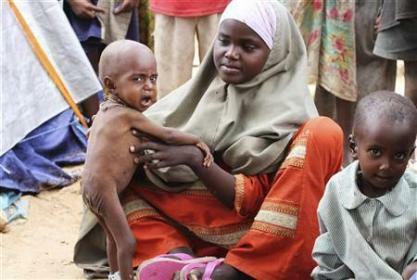 The worst-hit Somalis live in areas controlled by al Shabaab militants and many have risked their lives to travel to Mogadishu in search of food aid. The rebels, who have been waging a four-year insurgency against the Western-backed government, withdrew from the capital at the weekend, saying it was a tactical move. There have however still been outbreaks of fighting. The militants, who oppose Western intervention, imposed a ban on aid agencies, saying aid creates dependency. They lifted the ban last month when the food crisis hit critical levels, only to seemingly renege on it. “We have, over the last month, gained additional access to areas which previously we were not able to operate in,” Stanlake Samkange, the World Food Programme’s regional director for east and central Africa told reporters on Thursday. Samkange declined to say which areas the agency now had access to, fearing it could become a target. The WFP had been saying aid agencies have not been able to reach more than 2 million Somalis in the worst-hit areas, which are mostly in southern Somalia, because al Shabaab had blocked access to most aid organisations. WFP now provides assistance to over 1.5 million people in Somalia’s famine zone. Al Shabaab’s retreat from Mogadishu has also raised concerns of a security vacuum which African Union (AMISOM) peacekeepers and government troops would not be able to control. “Al Shabaab has withdrawn but security has not been established throughout the city,” Samkange said. Samkange referred to an incident last week when a firefight erupted during a WFP food distribution operation at the Badbaado camp on the outskirts of Mogadishu and residents and government forces looted tonnes of food. Samkange said over the last month the WFP has had more than $250 million in contributions and pledges and over 100,000 tonnes of commodities and stocks throughout the region. More than $100 million worth of food is on its way to the Horn of Africa region. But the aid could be at risk, with legislators in the United States proposing further cuts for USAID in fiscal year 2012 by $488 million from last year’s level and $705 million less than the Obama administration requested. The bleak economic outlook in the United States and Europe – traditionally major aid donors – is also raising fears some sources of assistance could dry up. “What’s important is that we as the United States continue to support our foreign assistance and particularly food assistance,” she told reporters in Nairobi. Samkange said the WFP faced a $250 million shortfall over the next six months, but that it had enough resources in its pipeline to support those in need now. Tony Hall, Washington’s former ambassador to U.N. agencies, cautioned against the Congressional bill.